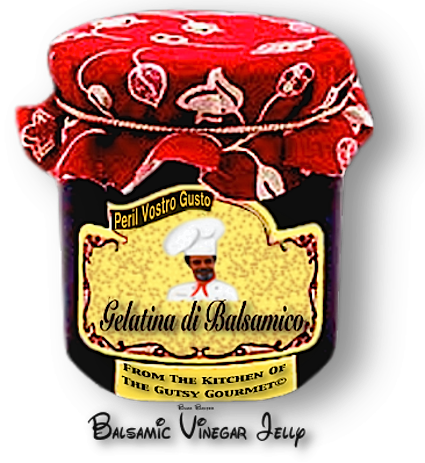 BALSAMIC VINEGAR JELLY - A VERY CONVENIENT WAY SERVE THIS CONDIMENT TO YOUR GUESTS WITH A LITTLE PANACHE. Small squares or other shapes of gelatinized balsamic vinegar for your guests to add to strawberries, meats or vegetables without having a liquid to "pour on". The not so "tacky" way to present this condiment. Keep this form of balsamic vinegar in your fridge and it will be available whenever you need to serve it with a little style. 1. Add the wine and balsamic vinegar to a sauce pan, whisking to combine. the mixture for 35 seconds, then remove the pot from the heat. your cake pan, the taller your jellies will be. I like them about ¾ of an inch thick. the pan in the fridge overnight will ensure the jelly is set all the way through. shaped cutters to make other shapes**SEE COOK'S NOTES**. 1. If you are going to use a shape other than a square,  make only as many of that shape you will need.